I hope you've picked up this book because you're looking for a good-paying career as a licensed journeyman or master plumber. That's exactly my goal: to launch your career by helping you get licensed. 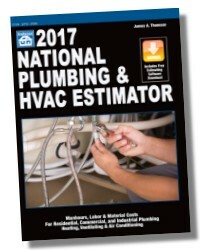 This book has the information you need to pass a plumbing exam based on either of the two popular national codes. If you've been installing plumbing systems for years as an unlicensed plumber, this book is for you. There's no need to work under the handicap of not having a license. 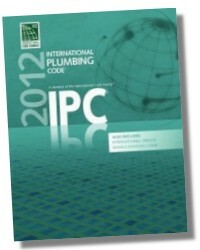 The information between the covers of this book will cover every subject that's likely to be on most plumbing exams. 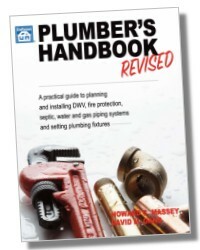 If you're just starting as an apprentice plumber, this book is also for you. It begins at the beginning. You'll have no trouble understanding what's explained here. Read carefully and you'll soon earn the recognition that licensed professionals are entitled to in modern society. In most communities, any plumber working without supervision must be licensed. Many states now require the certification of journeyman plumbers as well as specialty plumbers. This trend is sure to continue as legislatures recognize the need to protect the public from charlatans and the incompetent. Let me issue a caution right at the beginning. Don't let anyone convince you that studying for a plumbing exam is a waste of time. It isn't. Most licensing authorities prepare demanding exams that are a good test of the examinee's knowledge. These exams guarantee that plumbing installed in modern buildings will meet minimum standards for protecting the lives and health of building occupants for many years. If you don't believe that slipshod plumbing and haphazard sanitary systems can be a major health menace, you haven't traveled in foreign countries where plumbers are neither licensed nor held to reasonable standards of competence. Begin your study for the exam with two points in mind. First, you're going to take the exam seriously. You'll pass, but only if you study carefully each of the questions and answers in this book. Second, every minute you spend studying this book is a minute well spent. What you learn for the exam is the foundation on which your professional career will be built. Understand also that the licensing authority isn't: the enemy. They aren't trying to keep you out of the plumbing profession. They only want to set some basic standards. The public should be assured that all licensed plumbers are knowledgeable professionals. That's good for society in general, and it's good for all professional plumbers who live and work in your community. Before I go any farther, let me offer some information on my background. I've been an apprentice, journeyman and master plumber. For 15 years I ran my own plumbing contracting company. For 14 years I was assistant plumbing chief and plans examiner for a building department. I've helped write, monitor and grade plumber's exams. I have a pretty good idea of what you need to know to pass the exam. Unfortunately, I see far too many applicants who are not well prepared when they sit down to take the test. Let me make this clear - taking the test without doing a good job of preparation is a complete waste of time - both yours and that of the licensing authority. The results are predictable. Don't make that mistake. The most common reason for failure is that the applicant didn't study properly because he didn't know how, or studied the wrong material. This book should forever put an end to that excuse. You have in your hands the most complete, easiest-to-use, most practical reference available for preparing to take the tests that are actually given today. Read this book carefully, examine every question, understand all the answers. Do this, and there's no way you'll be unprepared on examination day. All the common questions and answers are here, of course. But just knowing the answer isn't always enough. Sometimes it's just as important to understand why a particular answer is correct. That's why many answers include a quotation from the appropriate code reference. Sometimes the correct answer depends on which code is being used in the jurisdiction. If that's the case, I've given the correct answer for each of the two popular national codes. And sometimes you'll find notes or clarifications under the answer when there's an important point you might miss. There was a time when a few years of experience and some knowledge of the gas and local plumbing code were almost enough to guarantee a passing grade. The old tests were usually closed book exams. No reference materials were permitted in the examination room. These tests evaluated the applicant's memory of the code and his ability to illustrate and design plumbing systems. That wasn't necessarily the best way to test a plumber's knowledge. No plumber has to work completely without reference books. Memorizing code sections isn't practical. It's also important that you know where to find an answer and have the background to interpret what the reference book says. Today, you'll probably take an open book exam which asks you to solve practical problems and answer questions from recommended references. That's closer to the type of problems plumbers face every day in their work. Speed in locating the right reference for each question (and making the correct interpretation) is essential. Most questions given on exams are based on the local plumbing and gas codes. Other test questions will likely be taken from references recommended by the examining authority. You'll probably receive a list of approved references when you apply to take the exam. These approved references are the only books allowed in the examination room. 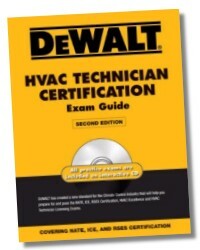 The following is a typical list of approved references for a journeyman plumber's exam. But this is an example only. Make sure you use the actual list recommended by your testing authority. 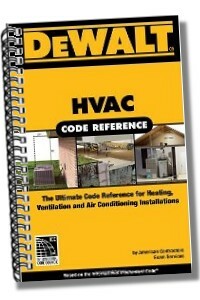 Your local plumbing code, plus any applicable ordinances and amendments. The master's exam list will be longer and includes several subjects that aren't covered in the references listed above. Get all the recommended references as soon as possible. If you live within driving distance of a well-stocked technical bookstore, they'll probably have most or all of what you need. Smaller general bookstores usually don't stock many technical books. But they may have some of the listed titles. Most bookstores are willing to special order books for you, but you'll have to wait four to six weeks for them to arrive. Remember that books and pamphlets used to improve or maintain your professional skills are deductible on your income tax return. They're also valuable references even after you've passed the exam. Don't be afraid to spend what's needed to get the recommended books. They'll be a good investment. Five major plumbing codes are used in the United States: Basic Plumbing Code, ICBO Plumbing Code, Standard Plumbing Code, National Standard Plumbing Code and the Uniform Plumbing Code. Several states have written their own plumbing codes. The five model codes are written by private organizations that have some interest in improving standards in the plumbing industry. By themselves, these model codes are not the law. They're written in hopes that some city, county or state will adopt them as a regulation. When your city, state or county does adopt a model code, it becomes the authority for all plumbing work done in that jurisdiction. Of course, the code adopted is entirely up to the governing authority in your city, county or state. And that branch of government is free to amend, delete, or supplement the code that's actually adopted - and many do. Almost all plumbing codes in the United States are "referral codes." They refer to other standard references when describing materials and design procedures. For example, every model plumbing code includes a table which lists all the plumbing materials acceptable for use within the jurisdiction. The Standard Plumbing Code states, "Plumbing fixtures shall be constructed from approved materials, have smooth impervious surfaces, be free from defects and concealed fouling surfaces, and shall conform to the standards listed in Table 500." The standards for plumbing fixtures as listed in Table 500 were developed by the American National Standards Institute, Inc. (ANSI). You'll see many references like that in your plumbing code. The Standard Plumbing Code lists 31 separate standards in the plumbing section alone. A few of these references are ANSI (mentioned above), ASTM (American Society for Testing and Materials), CISPI (Cast Iron Soil Pipe Institute), FS (Federal Specifications) and NBS (National Bureau of Standards). All references in your code place a burden on you, the plumber, to understand what's required and comply with what's called for. 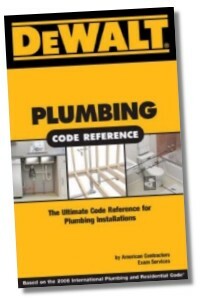 Questions in the plumbing systems section of this book are based on the two most popular national codes, the Standard Plumbing Code and the Uniform Plumbing Code. If you compare the code references for each question, you'll see how similar these plumbing codes actually are. In cases where there are some differences (mainly in the area where fixture units regulate pipe sizes and lengths), I've provided notes to explain the differences. 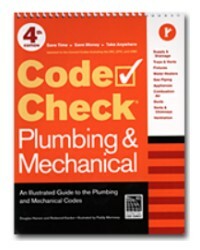 Most states adopt all or nearly all of one of these two popular codes and, of course, use that code as the authority for the state plumbing exam. The Standard Plumbing Code is used in Alabama, Arkansas, Florida, Georgia, Louisiana, Mississippi, North Carolina, South Carolina, Tennessee, and some parts of Delaware, Missouri, Oklahoma, Texas, and West Virginia. The Uniform Plumbing Code is used in Alaska, California, Hawaii, Idaho, Maine, Montana, Nevada, New Hampshire, Oregon, Utah, Washington, and some areas of Arizona, Colorado, Iowa, Kansas, Missouri, Nebraska, North Dakota, Oklahoma, Pennsylvania, South Dakota, Texas, West Virginia, and Wyoming. If you don't live in one of the 34 states listed above, the answers to some questions may vary slightly from the answers given in this book. But the differences between most plumbing codes is growing smaller and smaller with each passing year. After all, what's good plumbing practice in Massachusetts is also good plumbing practice in Indiana. 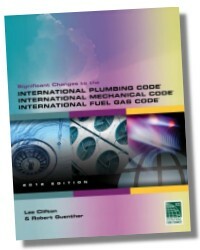 In the section on gas systems, I've based the questions and answers on the Standard Gas Code. 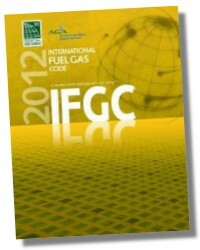 It's compatible with the popular National Fuel Gas Code, and probably with whatever gas code is adopted in your area. The Standard Gas Code provides (as do all gas codes) the minimum requirements for gas installations. Here's an important point: All exam questions are based on minimum code requirements. If the minimum pipe size permitted under the code is 1/2" and you answer 3/4" just to play it safe, your answer is incorrect. 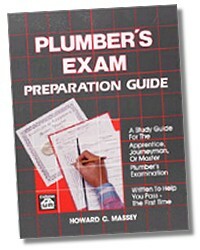 This book is a guide to preparing for the journeyman or master plumbing exam. It isn't a substitute for studying the recommended references and it won't teach you the plumbing trade. But it will give you a complete knowledge of the type of questions asked in the plumbing exam. It will also give you a "feel" for the examination and provide some of the confidence you need to pass. Emphasis is on multiple-choice questions because that's what nearly all tests have now. I've grouped the questions into chapters. Each chapter covers a single subject. This will help you discover your strengths and weaknesses. Analyze the questions you miss on the practice exam at the back of this book. You'll probably notice you're weaker in some subjects than others. If you've missed a lot of the gas questions or many of the math questions, go back and study these areas again. Set aside a definite time to study, following a schedule that meets your needs. Study two or three nights each week or all day on Saturdays. Study alone most of the time. But spend a day reviewing with a plumbing buddy before exam day. You can help each other dig out the facts and concepts you'll need to pass the exam. Study in a quiet, well-lighted room that's respected as your study space by family members and friends. If it's hard to find a spot like that in your home, go to the neighborhood library where others are reading and studying. Before you begin to study, spend a few minutes getting into the right frame of mind. That's important. You don't have to be an Einstein to pass the plumber's exam. But good motivation will nearly guarantee your success. No one can provide that motivation but you. Getting your license is a goal you set for yourself; it's your key to a satisfying career and a better paying job. As you study each reference, highlight or underscore important points with a yellow marker or red felt tip pen. That makes it easier to find important passages when you're doing the final review - and when you're taking the test. Put paper tabs on the corners of each major section in all the references you'll take into the exam room. On the portion of the tab that extends beyond the edge of the book, write the name of the section or the subject. That makes locating each section easier and quicker - an important consideration on an open book test. Speed in locating answers is important. In the sample exam in this book, which is based on actual exams, you'll have less than four minutes to answer each question! Your study plan should allow enough time to review each reference at least three times. Read carefully the first time. The next review should take only about 10% of the time that the first reading took. Make a final review of all references and notes on the day before the exam. This is the key to success in passing the exam: Review, review, review! The more you review, the better your grasp of the information and the faster you'll be able to find the answers. Your examination questions were probably compiled from lists submitted by members of the plumber's examination board. Board members usually include several senior plumbing contractors, perhaps a college professor, a registered engineer, and a code authority like a plumbing plans examiner. 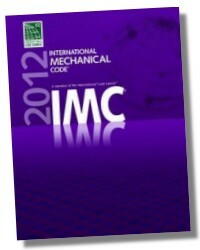 The exam will include code, practical, and theoretical questions. Some boards prefer theoretical questions. Others favor practical and code questions. No matter which type your examining authority emphasizes, this book will help you get prepared. In areas where the journeyman or master plumbing exam is given two or three times each year, the examining authority will have several basic exams that are used in rotation. But the same examination will never be administered twice in a row. The test writers maintain a bank of several hundred questions covering each test subject. Questions are selected at random, and chances are that some of the questions on any exam have already been used on an earlier examination. Many questions are known as universal truths. With minor variations, these questions will be on nearly every plumber's exam in the country. 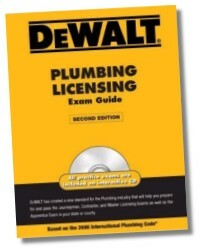 This book is filled with the questions that pop up on nearly every plumbing exam. Although plumbing is a complex trade, it's encouraging to note that there are only so many subject areas that any test can cover. And many of the questions on the exam will closely resemble questions in this book. Nearly all examination questions will be objective. This means you won't be required to draw complex piping isometrics of DWV or water piping systems and you won't have to write any essays. But many examinations do require that you at least identify which isometrics are wrong and draw simple corrections. The afternoon portion of the examination (four hours in duration), given on the first day, has been changed. Although all of the 80 questions are related to codes, approximately 10 questions will concern the interpretation of isometric drawings in which the examinee will be required to identify errors in the drawings, if any, in accordance with code requirements. In addition, another 10 questions will require the examinee to examine isometric drawings. If the drawings are not in conformance with codes, the examinee will be required to redraw isometrics correctly in the spaces provided. As you know, the lines on isometric drawings represent pipe and fittings. Symbols are used to show the location and type of fixtures. If your examining board requires reading and drawing of isometrics, you'll need additional preparation for the exam. 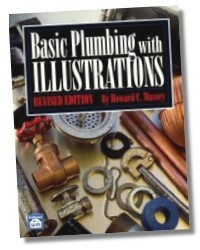 Plumbers Handbook, by this author, explains how to read and create plumbing isometrics. If your local bookstore doesn't have Plumbers Handbook, use the order form at the back of this manual. Once you understand the key principles, it's easy to read and make isometric drawings. Following this introduction, you'll find a sample answer sheet that was used for a major plumbing examination. Answer sheets like these are designed for computer grading. Each question on the exam is numbered. Usually there will be four or five possible responses for each question. You'll be required to mark the best answer on the answer sheet. You should mark answer D for question 1 on the answer sheet. Your answer sheet may vary slightly from the one that follows this section. But no matter what the answer sheet looks like, be sure to follow any instructions on that sheet! Putting the right answers in the wrong section will almost certainly cause you to fail. On the day of your examination, listen to any oral instructions given and carefully read the printed directions. Failing to follow instructions will probably disqualify you. There won't be any trick questions on most exams. Examination boards usually take their work very seriously. But the test writers will probably include at least a few questions that have to be read very carefully to be understood. The question may look familiar and the answer may seem obvious. But re-reading the question may point out some subtle distinction that makes the obvious answer totally wrong. Any time the answer seems obvious at first glance, read the question again. Always look for the qualifying word or phrase in the question. Words like always, never, least, most likely, smallest, but not less than, shall and may can be dynamite. They can change the whole meaning of the question. Sometimes several of the answers may seem possible. But only one will be correct. If you're not sure of the answer, use the process of elimination. Strike out answers you know are wrong. Then select the most likely of the answers that remain. This can change your odds from five-to-one to two-to-one on a question. Don't ever assume that there's an answer pattern. I've never seen a plan­ned answer pattern on a plumbing exam. By chance, there may be a short series of answers that go "a, a, c, a, a, c, a, a." But don't assume that the next answer is "c". It probably isn't, and you'll probably miss several questions if you think you see a pattern in the answers and try to follow it. Read each question carefully and give the answer you think is correct. Most important, pace yourself. Spend the first minute or two after the exam is passed out looking over the entire test booklet. Make an estimate of how many minutes should be allowed for each section or for each question. Check your progress after each 30 minutes. Most applicants won't finish all questions. Any question you don't answer will always be wrong, of course. Time will nearly always be at a premium on an open book exam. With enough time everyone could get 100%! Using your time wisely may be half the battle. Don't spend too much time on the toughest questions. It's a mistake to squander 10 minutes on the hardest question in the exam (and get it wrong) and then leave several relatively easy questions unanswered because you ran out of time. My advice is to skip the hard questions on the first pass. Then come back to them as time permits. If you complete the exam early, don't leave the room. Spend the remaining time reviewing your answers. Try to find at least one error. It could mean the difference between passing or failing the examination. Many applicants do fail by just one point. Don't find yourself in that position. Make the most of every second available. I've included here questions on gas systems, specialized plumbing systems and several other plumbing-related topics. There are two reasons for this. First, many exams include questions on these subjects. Second, this information is not readily available in the standard reference books. You may have trouble finding books that cover these questions. This book is organized into five sections. Part One has questions and answers and code responses on plumbing systems. Part Two has questions and answers and code responses on gas systems. Part Three has questions and answers and code responses for more specialized plumbing subjects. Part Four has questions and answers and solutions (where applicable) on plumbing-related topics. Part Five is a sample examination. Take this test two or three days before you are to take the actual exam. Use it to spot areas where you need extra review. Enough of the preliminaries. It's time to get started with the questions and answers. Used correctly, this book will give you the confidence you need now to prepare thoroughly for the upcoming examination. Happy studying! And best wishes.